Roger was an active Macoun member from the mid-1980s through the mid-1990s. He was usually President or Vice-President of his group, and became Editor of both the Newsletter and the Little Bear. In 1995, he won the Macoun Club’s Baldwin Scholarship. 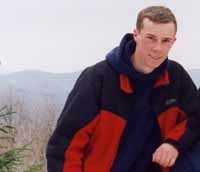 When he was 17, Roger participated in the Junior Rangers program. That led into four summers working in Ontario’s parks, including Sandbanks Provincial Park, and as head of the National Heritage Education department at Kettle Lakes Provincial Park near Timmins. After finishing his Honours Bachelor of Science in Biology at McMaster University, Roger moved to Paris, France, to pursue graduate studies in medical biology. He received his PhD in Cardiovascular Physiology in 2004 and then worked as a pharmacology scientist for Servier Pharmaceuticals in their angiology division. In 2015, the company posted him to Montreal, Canada. 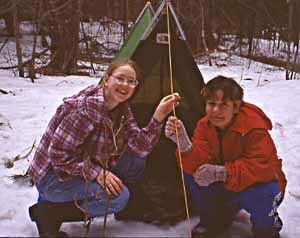 Rebecca joined the Macoun Club in 1987, and right away discovered the fun of field trips, rain or shine (caught puffing puffballs with Solange, below right). After a few years, she was always President or Vice-President of her group. And she was sure to be on every camping trip — snowshoeing, swimming, squelching in the mud. For a Study Area project, Rebecca took on a whole slice of time, from the end of the Champlain Sea 10,000 years ago down to the present. Under the guidance of former Macoun Club leader Paul Hamilton, in the Museum of Nature, she detailed the changing character of a pond’s diatom populations, which had been preserved in a peat bed. The experience of working with a microscope in the Museum determined her to purchase an excellent instrument of her own. One of the first things she looked at — “after diatoms of course” — was a lichen. The discovery of diatoms, an expensive microscope . . . where would they lead? At the University of Western Ontario, Rebecca decided on an unusual combination of studies, and we are sure she’s had to explain it many times: music, and microbiology. In the summer of 2003 she worked for the huge GLEI (Great Lakes Environmental Indicators) project. It involved sampling all forms of life from birds to benthos, first along the shoreline east of Chicago, and then (because their bigger boat gave out) in swamps. She obtained a Master’s in clarinet performance from the University of Cincinnati College Conservatory of Music. Solange was a member from 1988 to 1998. She was a regular on every field trip and camping trip for years, and always seemed to come to prominence through her unfailing interest in nature, and her unique perspective on the world. 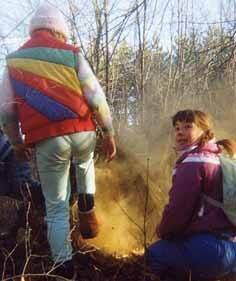 At right and above, Solange and Rebecca making a smoke of puffball spores, Nov. 17, 1990. By 2011, she had returned to Canada and the Macoun Club — as the parent of a very enthusiastic new member! By 2015, she had two of them in the Club. Katherine came to the Macoun Club just a little late, and could only stay with us for seven years, from 1991 to 1998, but she so filled that time with fun and adventure that the whole period looms large in the memory. She was Secretary for five years, Vice President for one, and President of the Seniors in her last year. She produced elaborately decorated newsletters month after month for years, and with a gift for gentle caricature, she contributed a number of humorous cartoons featuring her fellow members and the leaders. In some years, her prolific articles dominated our Little Bear magazine, and they now provide a detailed record of our many field trips, including some of the most misadventurous. Year after year, she organized the richest assortment of foods imaginable for our camping trips. In 2004, she retuned to the parks program, working in Samuel de Champlain Provincial Park. She then started her fourth year of Arts & Sciences studies at McMaster University. She now lives in Halifax. Here we see Solange and Katherine setting up their tent at Pakenham. William came into the Macoun Club already familiar with snakes and frogs on a scientific-name basis. Gradually other interests have emerged: among them fossils, birds, and insects. He can catch an early mosquito and a day later tell us what species it was. (That is a skill that should be much in demand, as Canadians begin to grapple with West Nile virus.) If the creature has an English name, he can generally tell us that, too. Although William has graduated from school and left Macoun Club, he sometimes comes back for a day. He joined us one day in May at the Study Area, we saw how these skills are employed with exceptional enthusiasm and delight. William tudied biology at the University of Guelph. 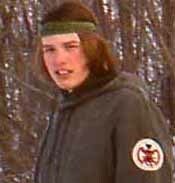 Starting in the last years of his time with the Club, he worked summers in Algonquin Park’s naturalist program. By 2014, he was a lecturer at the Bio-Protection research centre in Lincoln University in New Zealand. 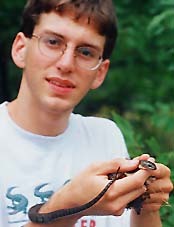 Here he is shown with a Black Rat Snake at Murphy’s Point Provincial Park. Eric came into Macoun Club with an enthusiasm for nature that seemed only to grow while he was with us. As if to make up for already being so close to graduating from high school when he joined, he participated in the field trips of both Juniors and Seniors. And if he couldn’t induce his fellow Macouners to go with him, he’d explore the Study Area on his own, binoculars at the ready. In his last year, he was President of the Senior group. All photos donated or provided by members and leaders, past and present. Updated in places in January 2019. Coding revised in May 2016.